A photo of soldiers from the Eight-Nation Alliance, Beijing, 1900. 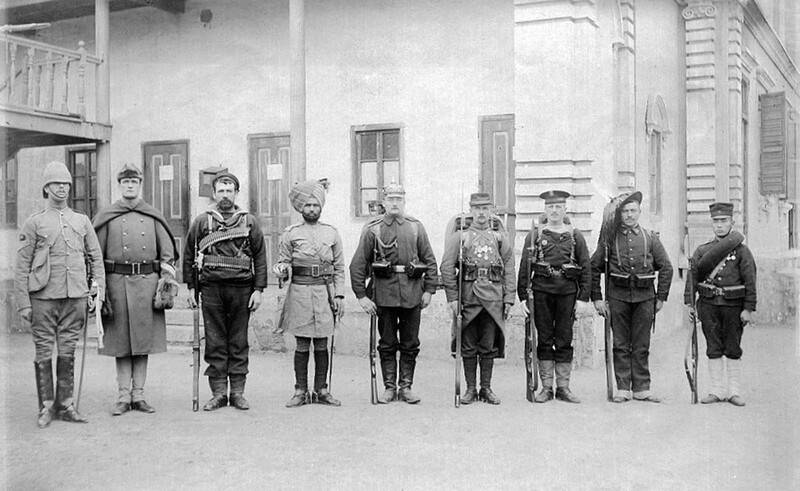 This photograph shows soldiers of the Eight-Nation Alliance in 1900, left-to-right: Britain, United States, Australian, British India, Germany, France, Austria-Hungary, Italy, Japan. This was a British propaganda photo where the British requested the heights in order to reflect racial/ethnic supremacy. The British requested an American slight shorter than the Brit they were sending. However the Americans sent someone taller than the Brit. After all, the United States were a continent sized nation while Britain was a tiny island. So the British used a huge hat to overcompensate. The photo is fascinating because it captures a significant amount of racial/ethnic views of the world at that time. White Anglos at the top (British, Americans and Australians) and everyone else positioned accordingly with the non-white Japanese at the low end. The Indian was put ahead of the continental Europeans as a small insult – “our dog is superior to you…”. The Eight-Nation Alliance was an international military coalition set up in response to the Boxer Rebellion in the Qing Empire of China. The Alliance consisted of the United States, British Empire, Germany, France, Austro-Hungary, Italy, Russia, and Japan. During the summer of 1900, they assembled a military coalition to protect their influence in China. The Boxer Rebellion was a Chinese movement that had formed in response to growing foreign power in China. The Boxers wanted to end outside influence and began to attack westerners. In June, 1900 Boxers besieged the Legation Quarter of Peking, modern Beijing. They trapped a large number of foreigners and Chinese nationals inside. The Chinese government threw its support behind the Boxer rebellion, and declared war on the foreign coalition. The Allies sent a relief expedition to relieve the siege on June 10th, but it was beaten back after encountering heavy resistance. On August 4th the Allies launched a much stronger relief expedition that was able to break the siege and force and end to the short, but violent, war. Although the rifles are difficult to distinguish (on the picture), an Austro-Hungarian soldier’s Mannlicher 1888 is visible, with a distinctive gap between the trigger guard and magazine. By the time of the Eight Nation Alliance, the powers brought together a slew of rifles that had been competing with one another for military contracts on both sides of the Atlantic. Prior to adopting the Krag-Jorgensen in 1892, the U.S. Army had tested over 50 designs. French soldiers carried their Lebel rifles into Peking. German troops brought the new 1898 Mauser. Austro-Hungarian soldiers marched with 1888 Mannlicher rifles, updated in 1890 to a new cartridge. Italians had their Model 1891 Carcano. the Japanese fought with a mixture of their new Type 30 Arisakas and older Murata rifles. The Russians, who would go to war with Japan in 1905, used the M91 Mosin-Nagant. Troops from around the British Empire were armed with the new magazine Lee-Enfield, and its predecessor the Lee-Metford. Soldiers from the U.S. Army were equipped with Krag-Jorgensens, while U.S. Marines were armed with Lee 1895 rifles. In the eighteenth and nineteenth centuries, people of European descent in North America were far taller than those in Europe and were the tallest in the world. The original indigenous population of Plains Native Americans was also among the tallest populations of the world at the time. In the late nineteenth century, the Netherlands was a land renowned for its short population, but today its population is among the world’s tallest with young men averaging 183.8 cm (6 ft 0.4 in) tall.